Samsung wants to keep it simple. The company is cleaning up its line of flagship smartphones so users now have three choices: a Galaxy, a Galaxy Edge or a Galaxy Note. 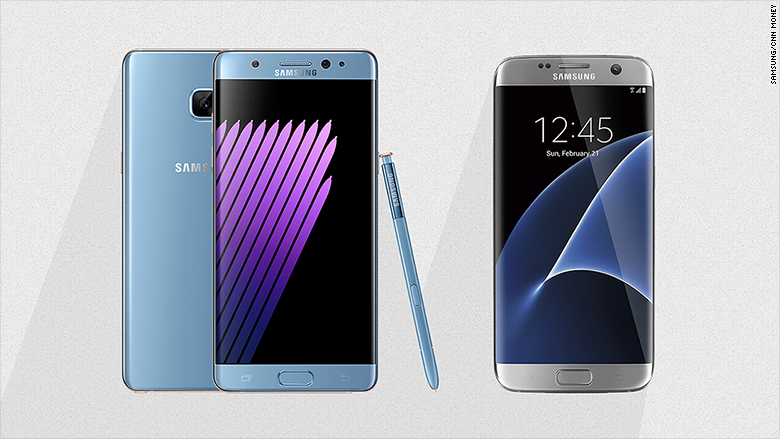 That's why the new Note 7, which was announced on stage at event on Tuesday, looks a lot like Samsung's previous plus-sized smartphones, the Note 5 and S6 Edge+. Coming in with a 5.7-inch Quad HD resolution display, the Note 7 is Samsung's answer to best the 5.5-inch iPhone 6S Plus. Samsung says it skipped over the Note 6 in favor of the Note 7 name to "unify [its] product portfolio" and "minimize confusion." With a curved, waterproof metal and glass body, the Note 7 borrows some designs and features from the popular 5.5-inch Samsung Galaxy 7 Edge, including the always-on display and "edge" panel of apps. 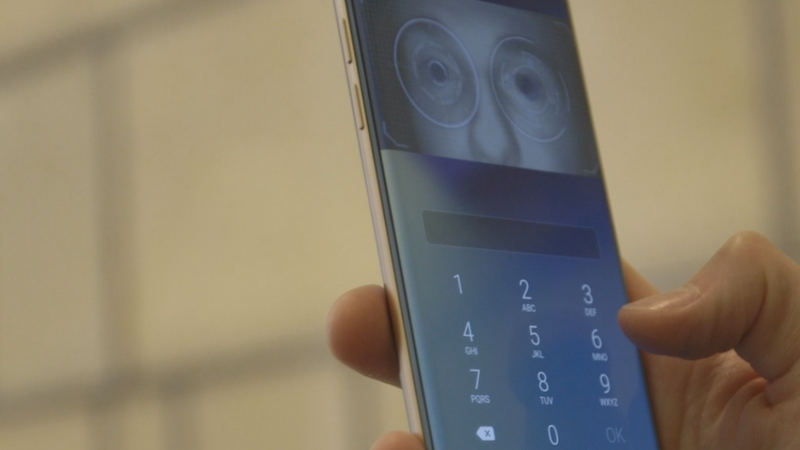 But under the hood, the Note 7 includes several unique features such as an iris scanner, which allows users to unlock the phone with their eyes. It also comes with a waterproof stylus, a built-in program to make GIFs and a series of features which make the device super secure. It comes in four flavors, too: black, gold, silver and blue coral. 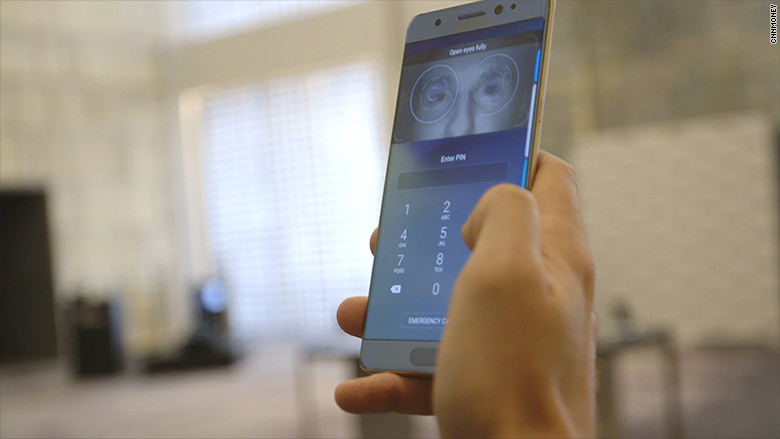 The iris scanner is probably the most buzzed-about feature to land on the Note 7, but Samsung isn't the first to use it as a biometric security. Fujitsu, Alcatel and Chinese manufacturer ZTE already make phones with similar technology. So how does it work? Samsung has added a new infrared camera that scans your eyes using infrared light emitted from the LED on the front of the phone. You'll want to hold it about a foot away from your face, and the phone will show how to line it up your eyes. (Don't worry, you won't be surprised with a flash of light.) The data collected from the scan is saved and encrypted on the phone, and you can opt to unlock your phone or a specific app that way moving forward. Samsung says glasses and contact lenses (particularly colored ones) can get in the way at times, but we weren't wearing either when the scanner experienced issues during our brief testing. Although, in theory, the scanner is a novel way to keep phones locked, you'll still need to use your fingers to get to the iris scanner from the lock screen -- at which point, you could easily type in a passcode or use the fingerprint reader instead. Like BlackBerry (BBRY) and other device manufacturers this year, Samsung is placing an emphasis on security. In addition to the iris scanner, the company also created a separate folder on the Note 7 for sensitive files. The new "Secure Folder" is protected by Samsung's hardware-level KNOX security, and can be unlocked with an additional layer of protection by using a passcode, fingerprint or iris scan. 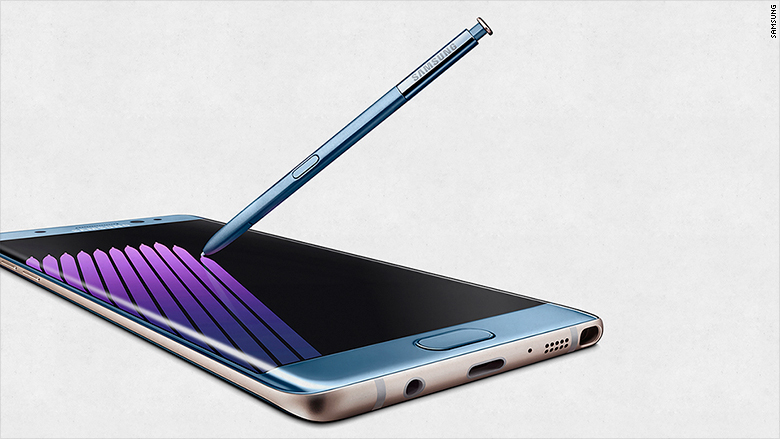 Compared to its predecessor (the Note 5), the Note 7 is an unquestionable upgrade in design. The front edges of the phone are curved like the Galaxy S7 Edge, but so are the back edges. While this may seem like a minor adjustment, it does make the Note 7 slightly more comfortable to hold. But that difference is hard to notice because the Note 7 is also slightly bigger and heavier than the S7 Edge. The Note 7's 5.7-inch screen sits inside a body that's slightly smaller but thicker and heavier than the Galaxy S6 Edge+. It's noticeably larger and heavier than the Galaxy S7 Edge, which has a 5.5-inch screen, but not by much. The Note 7 comes with a standard base of 64 GB of expandable storage -- unlike the Galaxy S6 Edge+, which only came with 32 GB or 64 GB of fixed storage. The Galaxy S7 Edge currently only comes with 32 GB of expandable storage. Meanwhile, the latest smartphone features a 3500 mAh battery, compared to 3600 on the S7 Edge and 3000 mAh on the S6 Edge+ and Note 5. The new Note 7 smartphone is on the left. The Galaxy S7 Edge is on the right. Samsung has a knack for taking popular digital habits and baking them into its phones. Last year, it made it easier for people to launch live-streams from their Note 5 via a feature directly through the camera and this year, the focus is on GIFs. With a Note 7, users will be able to take clips from YouTube or their own videos to create shareable GIFs without downloading any extra software. This will require users to use the "Smart Select" feature through the S Pen stylus. Just like the Galaxy S7 Edge, the Note 7 is waterproof for about a half an hour in up to 5 feet of water. 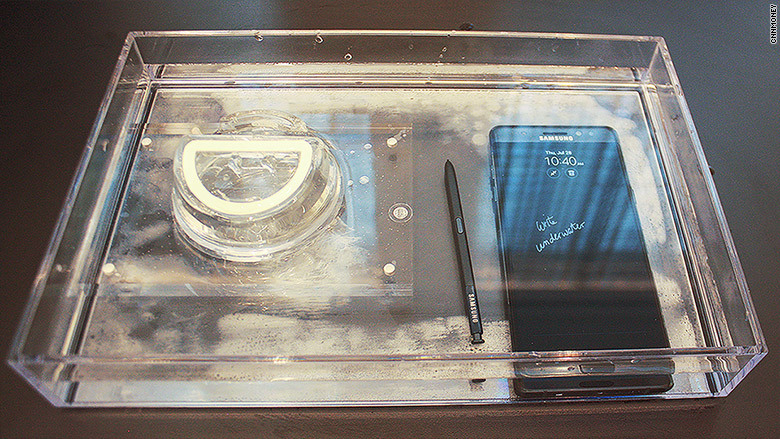 And yes, because the Note 7 features Samsung's S Pen, the stylus is just as waterproof. The combination means that if you ever need to, you could write notes underwater and pin it to your lock screen. Pre-orders for the Note 7 begin Wednesday. Carriers expected to start selling on August 19. T-Mobile (TMUS)and Sprint (S) customers can buy the device for $850, while AT&T (T) has it priced at $880, spread over its payment plans. Verizon (VZ)'s retail price falls in the middle at $864.